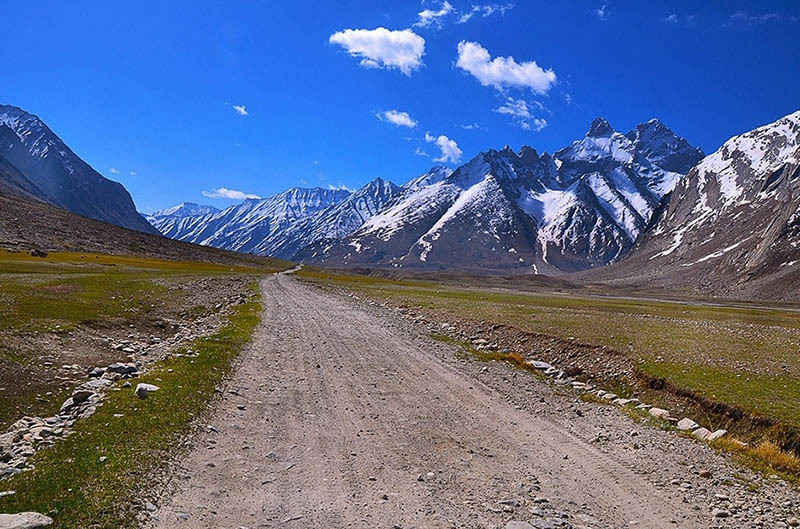 In my last article on Zanskar and Ladakh, I provided some important details using which you can calculate the total cost you will incur for a trip to Zanskar valley. While expenses incurred will heavily depend on factors like mode of travel, duration of the journey and personal spending habits; a minimum cost estimate can still be made which I talked about in previous post. Continuing on the same lines, in this article, I will suggest a few simple tips on how you can reduce the total cost in order to make a budget trip to Zanskar valley. Following these, you will be able to cut down your travel cost effectively and have a fun trip without it burning a hole in your pocket. Ladakh has recently seen a great boost in tourism in last few years. What once was an almost unknown destination has now become a hot favorite spot for tourism. As a direct result, the cost of visiting here has also significantly increased. Zanskar on the other hand still maintains its offbeat tag. Only a very small portion of people visiting Ladakh travel towards Zanskar valley due to which, it is still not that expensive. Keeping a few things in mind, which I will talk about in the article below, you can still and easily make a trip here without the total cost going off the roof. I think the biggest confusion when it comes to traveling to Zanskar comes due to its close proximity with Ladakh. People tend to get confused about whether to visit just Zanskar or incorporate it with their trip to Ladakh. For a brief introduction, Zanskar is the area around the small town of Padum. To get here, you will have to take the road from Kargil towards Rangdum. First you will travel through Suru valley, reach Rangdum, cross Pensi La Pass and drive through Zanskar Valley to arrive at Padum. Once you are done visiting here, you will then have to drive back to Kargil the same way that you came. A new road right now is under construction between Zanskar and Lahaul Valleys. Once this road is completed, it will connect the towns of Jispa and Padum; across the high altitude pass of Shinku La, It will however still be a couple of years at least before the work on this road is finished. So for now, the only way to visit Zanskar is to drive here via Srinagar and Kargil and go back the same way. The information I am providing below is more from the point of view of visiting only Zanskar. If you are also covering Ladakh in the same trip, then it will be a bit broader discussion. For the total cost of Ladakh trip and how you can keep reduce that, I recommend that you read How to Calculate Minimum Budget for Ladakh Trip? The biggest expense of your trip if you go by personal vehicle will be of fuel. It doesn’t matter if it was a car or a motorcycle, the money you will end up paying for gas will be almost half of your total expenditure. If you were on a strict or shoestring budget, the best way to save this money is to travel to Zanskar by either bus or shared cabs. Your first destination will of course be Srinagar and getting there by Bus or Train is not that difficult. After Srinagar, there is a regular bus connecting it to Kargil that you will then avail. From Kargil, you can travel to Padum by Bus but its frequency is not really that great. Another best and cost saving option then will be shared taxis which ply more regularly and which the locals too rely upon more. These are all ordinary JKSRTC buses that locals use to travel with and the ticket price is very nominal. Almost half of your money will be saved; and another upside would be to travel with the locals and get a firsthand experience of their lives. I have covered the topic of traveling to Zanskar by Public transport more in detail at How to Travel to Zanskar Valley by Bus and Shared Taxis. After the local bus service, this is the most cost effective mode of travel available in Ladakh and Zanskar. These run on a daily basis to all major towns and places on the way. Fare is almost the same as a bus will cost you and you can easily find these taxis from Bus stands. Majority of the locals use these to travel around and do not really rely on buses. The only catch is that you may not get a shared cab from Kargil to Padum all the way; and may have to break the journey in parts. For example, you can first board a cab for Sankoo or Panikhar, then another one for Rangdum and then finally for Padum. I have done it myself and so can you. Fortunately, there is still not too much of tourist rush in Zanskar and if you waived for a ride to a passing by truck, they will let you hop on. I traveled from Kargil to Rangdum in a shared cab, then jumped on a local truck carrying vegetables and groceries. A friend of mine did the journey from Sankoo to Padum on an Indian Oil truck. This will of course be totally free unless you decide to give the truck driver something that they accept. This means traveling in the months of May, October or early November. These months would be best in terms of accommodation. Most of the hotels and guest houses shut down during peak winters and late April is when they open up for business. There are not many tourists around this time and your chances of getting a good deal on accommodation will be great. Hotels will be more prone to lowering their prices and allow more than 2 people in the same room. Traveling to Zanskar before April and After November is not really an option right now. From Srinagar, you will not be get across even Sonamarg due to heavy snowfall. If you flew into Leh City, you will only be able to travel as far as Suru Valley via Kargil but no further. If you went in November, then you are risking being there in extremely cold weather with a high chance of getting stuck if the weather closed in. So the month of May marks the beginning of tourist season here and October pretty much ends it. If you went in either of these two months, there is a high chance that you may get a good deal on accommodation because there will not be many tourists around. Hotel and guest house owners at this time tend to agree for a lesser than quoted price. With the increase in tourism, more hotels and guest houses continue to come up in both Ladakh and Zanskar each year. Finding a place to stay is not difficult at all, no matter the month of your travel. If however you booked your stay in advance, chances are that you will just end up paying more. A better way would be to reach your destination first, find a hotel per your liking and negotiate an on the spot deal. Zanskar has ample amount of budget hotels and you will easily be able to find a hotel for Rs. 500 – Rs. 700 a night. Another great place to stay at would be the J&K Tourism Bungalows which never cost that high. Another point to consider could be that a trip to Zanskar definitely has an air of uncertainty to it. There could be a road block or maintenance work due to which you may not be able to reach your desired destination either in time or at all on a day. Or else it could just be the weather that may close in and force you to delay your travels for the day. In this case, any money you spent on booking a hotel ahead will then be wasted at worst. At best, it will see you rushing through bad roads because you have a hotel booked at the next town which is still far away. If you are looking for an on the spot deal for accommodation; then try to reach your destination well before dark. This will give you sufficient time for hotel hunting. If a certain hotel did not lower their price; then you can try the next one because there is still some sunlight left. The hotel owners too will realize this. If you reached a hotel after dark, then chances are that they will quote a higher than regular price and will not lower it; because they know you are out of time and choices. Even the hotel owner will then know that you will agree for a higher price because you are already tired and in an unknown town after dark. Once you cross Kargil and then until Padum, there are really no fancy restaurants in between anywhere. For most of the journey, you will be traveling through a remote Zanskar; villages or small towns where food cost will not be that great. At almost all of the places in between, you will continue to come across small eateries where you won’t have to pay much for a meal. On an overall basis, you should easily be able to wrap up your total meal cost for the day between Rs. 200 to Rs. 300. When traveling to a place like Zanskar and that too on a budget, you really will have to be flexible at several places; and I mean it in terms of accommodation and meals. You cannot be too choosy or specific about things because sometimes that may cost you more than you can afford. At several places and several times; you will be required to work with what you got for reasonable rates. You got to remember that you anyways just need a place to stay for the night; as you will be gone the next morning so be ready to adjust a little. Bringing your own camping gear is a great choice if you already own one. If not, then even buying a new one is not really going to cost you that much if you compare it to the total fare you will pay for accommodation at hotels. If a friend of yours own a good camping gear then you can also request them to lend you theirs. Zanskar is a vast landscape where you can pitch your tent pretty much anywhere for free; and save yourself some money that you will other spend for a night at the hotel. Or you can chose to pay a couple hundred bucks to any of the Dhabas on the way; and request them to allot you a spot to camp. In return, you can also use their washrooms and even eat at that particular dhaba. And that pretty much is it. Following the tips above, I am sure you will be able to reduce your total cost of the trip significantly; and make a budget trip to Zanskar valley. I hope the information was of help. If you have any questions; or need any further details; please feel free to ask in the comments section below; or at our Community Forum; and I will be glad to answer.